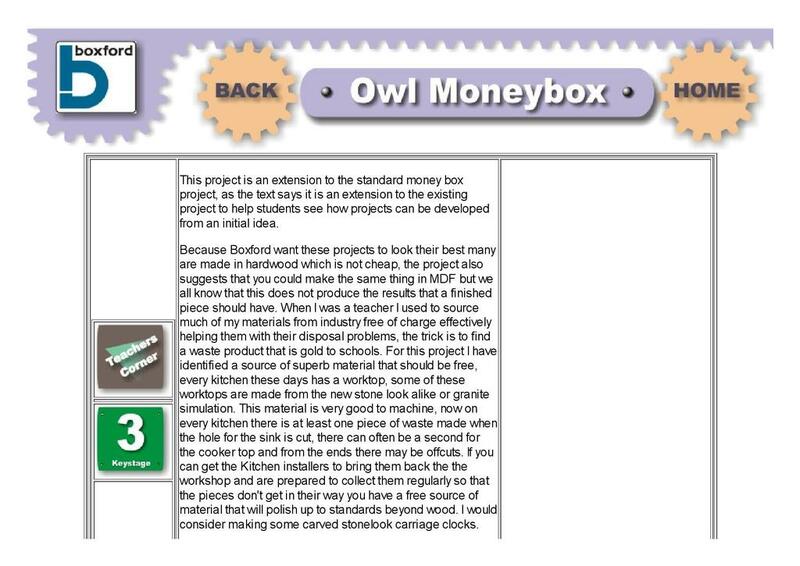 This resource from Boxford describes the design considerations and manufacture of a novelty money box. Exemplar CAD files are presented to facilitate manufacture of a product based on the shape of an owl and pictures of the finished product are shown. The history of piggy banks is outlined and images of a variety of money boxes are shown which could be used as stimulus materials for learners to design their own money boxes. Some of the design considerations, such as legislation on toys for children, are outlined. A series of screen shots of CAD software show the sequence of cutting operations for the wooden parts of the owl money box. These are be machined using a CNC router, with a selection of different cutting tools used. The money box also includes a nylon screw which can be manufactured on a CNC lathe and acrylic front and back pieces, which can be cut and etched on a laser cutter. Curriculum links include the use of CAD/CAM in the designing and making process.